I've mainly been trying to focus on my own art style for my uploads but I felt like drawing some Deedark today! It's been a long time since I've drawn any DL fanart, honestly I was getting a little rusty, but I had this sketch for probably like a year and decided to make it into something that looked like a sticker. Don't worry, even if it's been awhile these two are still my OTP! Well, no one can't convince me there weren't hints of Deedark all along! XD, I feel like how it would go is that Deedee would be the one to wreck all of Mandarks inventions and plans on accident, but he can't stay mad at her. Some time's he'd be apart of her stuff and try to enjoy it for her, like meditation, dancing and playing with ponies. In this scenario, I feel like the show would be about them and dexter would be a side character. Haha so is Dee Dee! Amen to that. Looks like we might as well be soul siblings in shipping DeeDark. We need all the people we can get for this ship! Ive seen some good stickers sold on redbubble, and I use the site myself for stickers or related products. mostly stickers though. i hope to see what you have if you put your work on the site! Well they sure still look on style of the show. 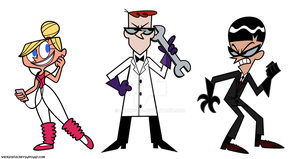 Yeah there where allot of Dexter Lab shorts that where somewhat stale, but I do like the art style of those end of the millennium debuted Cartoon Network shows of the 1960's retrofit Hannah Barbera designs the Dexter was a part of with Jhonny Bravo and the Power Puff Girls. Not too technical, but not too tablet looking either. Yes I love how Cartoon Network reinvented the mid-century style during the 90's!